Slender Man started off humbly as a creepypasta meme—a genre of horrifying, Internet-circulating images or legends—that first appeared on the Something Awful forums in 2009. It developed a devoted online following that took a grim turn when, in 2014, two Wisconsin twelve-year-olds attempted to murder their classmate as a sacrifice to the viral urban legend. Creepy, right? Last year, HBO released Beware the Slenderman, a documentary revolving around the meme and the moral panic that ensued after the Wisconsin sacrificial stabbing. A new film furthers the story by focusing on the haunting figure himself. The trailer for the film, simply titled Slender Man, was released on Friday, and it’s cover-your-face-with-a-blanket scary. The clip centers around a group of girls in a small Massachusetts town who summon Slender Man in an attempt to find their missing friend Katie. And as you can probably guess, that doesn’t go so well. Instead, they unleash a whole host of horrors because trying to summon a demon is never the right move. 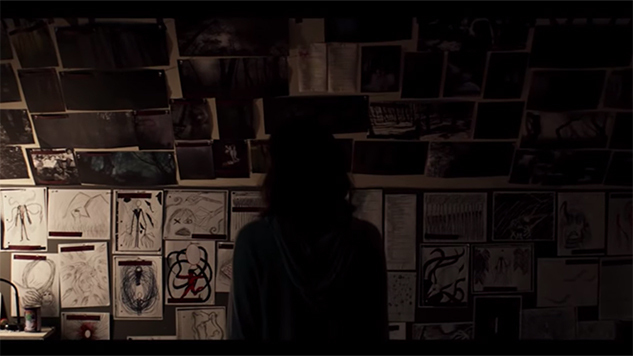 The trailer is full of dark shots of the inescapable Slender Man terrorizing the teens, snatching them with tentacle-like arms, getting inside their heads and possessing their bodies. Once you see him, you can’t unsee him. The film hits theaters on Aug. 10, but you can watch the trailer below…if you’re brave enough.